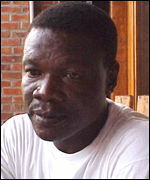 Mwepu Ilunga was a defender in the first black African team at the World Cup finals. Reminiscing on his experiences with the Leopards of Zaire (the country is now known as the Democratic Republic of Congo) at the 1974 finals in West Germany, Mwepu has mixed feelings. "I was very proud, and still am, to have represented Black and Central Africa at the World Cup. "But we had the erroneous belief that we would returning from the World Cup as millionaires," he told BBC Sport Online. "We got back home without a penny in our pockets. "Look at me now, I'm living like a tramp," an angry Mwepu said. The former right full-back remains bitter about the treatment he and his team mates received 28 years ago. Mwepu accused officials of the Zairean football federation of pocketing their wages and allowances at the tournament. After a 2-0 loss to Scotland, the Leopards were thrashed 0-9 by Yugoslavia. It was a result that did immense damage to the image of African football. Blame for the humiliation was squarely laid at the door of Zoran Vidinic, their Yugoslavian coach. But Mwepu says there were other reasons behind the Leopards poor performance. "Before the Yugoslavia match we learnt that we were not going to be paid, so we refused to play." At the last moment they were persuaded to turn up for the encounter but the normally combative Leopards did not put up a fight. Following the loss to Yugoslavia, the late Mobutu Sese Seko, Zaire's leader at the time, intervened directly in the team's affairs. "After the match, he sent his presidential guards to threaten us. The poor treatment at the World Cup was in contrast to the praises and gifts Mobutu showered on the team after they qualified for the tournament. "Mobutu was like a father to us. "When we qualified for the finals, he welcomed us in his home and gave each of us a car and a house. "Mobutu's generals were so jealous of the gifts we were given that he had to buy them a car each, to keep them quiet," Mwepu said. In their last World Cup game, Zaire lost 0-3 to Brazil, which meant they could return home without fear of retribution. But the performance of the African champions gave the Leopards the unenviable record of conceding 14 goals without scoring a single one. It was a World Cup that fans of the African game prefer to forget.